English décor is known for its tailored look and comfortable feel. 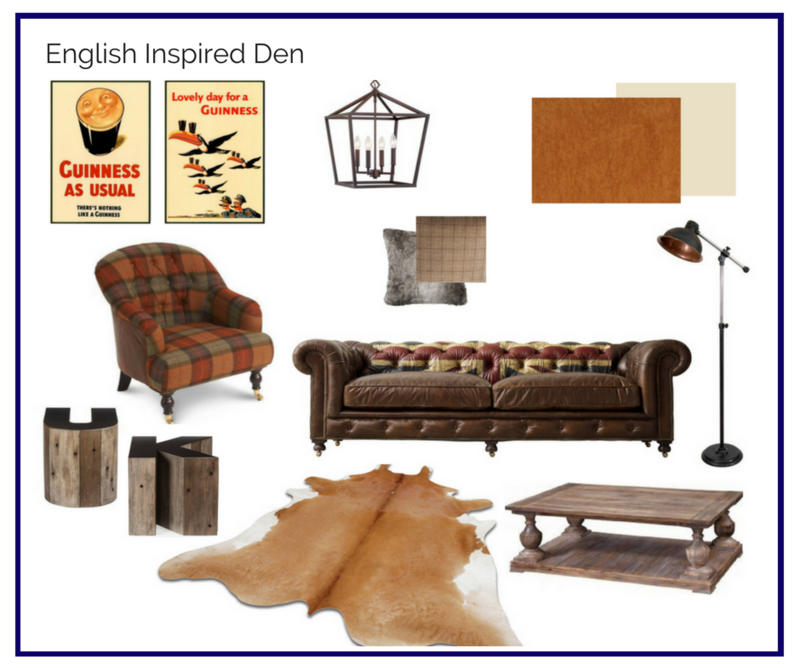 This month, we show our appreciation for our allies over the pond with an elegant yet playful English-inspired den. We started the space with a bold leather tufted sofa along with a set of stylish plaid and faux fur accent pillows. Then, we added a handsome tartan club chair paired with whimsical letter side tables that show our love for the United Kingdom. A dark metal lantern and floor lamp light the room while a hide rug adds comfort underfoot. Next, we coated the walls in a warm neutral hue and added art in the form of a pair of vintage Guinness ads. A set of rust-orange drapes completes the cozy look. Classic yet cheeky, I think we did our English counterparts proud with this space! Cheers, mate!